It seems to amuse people that this simple bake is the one I would take to my desert island. It has a very pleasant texture, sort of a cross between a layer cake and a Genoise sponge. 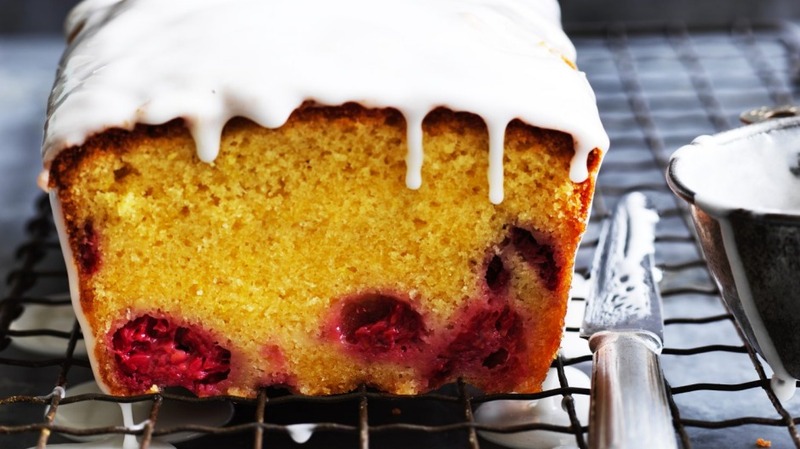 Without the acidity and sweet syrup of a lemon drizzle cake, it's an altogether gentler offering, with the fragrance of lemons coming mostly from the zest. You could add a tablespoon or two of poppyseeds for a pop of texture, but raspberries work beautifully for this summer variation. 1. Preheat oven to 175C. Line a loaf tin (20cm x 12cm) with baking paper and set aside. 2. Place the eggs and sugar in the bowl of an electric mixer fitted with the whisk attachment and beat on a medium-high speed for about 2 minutes until pale and frothy. Add cream and continue to whisk at same speed for about 2 minutes, until mixture is well combined and slightly thickened. 3. Meanwhile, melt butter in a small saucepan over a low heat, add lemon zest and set aside. 4. Sift flour, baking powder and salt together into a small bowl, then use a spatula to fold this into the egg mixture. Add raspberries, then gently fold through the melted butter and zest. 5. Spoon the mixture into the prepared loaf tin so it rises three-quarters of the way up the sides. Place the tin on a baking tray and bake for about 55 minutes, or until a skewer inserted into the cake centre comes out clean. Resist the temptation to open the door for the first 45 minutes. 6. Make the glaze by whisking the icing sugar with the lemon juice in a bowl. Allow the cake to cool for 15 minutes before removing from tin and onto a serving platter, then spoon over the glaze. The cake will keep for about three days, wrapped in cling film. TIP: For a slightly crusty glaze and more lemony cake, pour over glaze as soon as cake comes out of oven while still in the tin and let cool for about 30 minutes.